Website Inside Games covered the Tokyo launch, reporting how over 200 people lined up at the Bic Camera in Ikebukuro. Another 200 people lined up at the Yodobashi Camera in Akihabara. 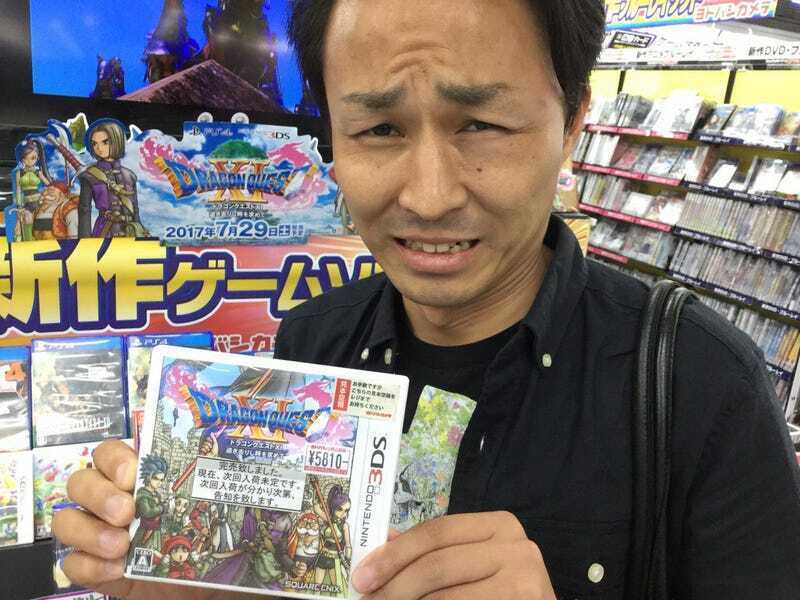 Some registers were marked “For Dragon Quest XI Only” to handle pre-orders. Shops also did this for Splatoon 2, and it seems like a smart way to prevent those with pre-orders from having to line up for a long time. Here’s the wait at the Bic Camera in Ikebukuro. Even at this Geo shop, there was a long DQXI line. This customer bought the 3DS version at the Bic Camera in Ikebukuro, where the line was over 200 people long. The Yodobashi Camera in Akihabara at 7:00am on launch day. The Yodobashi Camera in Osaka’s Umeda on launch day. Inside the Yodobashi Camera in Osaka’s Umeda. Another shot of the DQXI line in Ikebukuro. Seven am at the Geo store in Fukuoka. At 7:00am, the DQXI line at Yodobashi Camera in Akihabara was over 200 people long. People waiting to buy Dragon Quest XI at the same Akihabara store. The game, especially the PS4 version, even sold out at some stores. The PS4 version sold out the Yodobashi Camera in Tokyo’s Ueno. At this Toys “R” Us, there were PS4 and 3DS stock on Saturday, but by Sunday, the PS4 version was sold out. The notice near the penguin character states that the store is currently sold out. Both the PS4 and 3DS versions sold out at the Yodobashi Camera in Sendai. “Even though Dragon Quest was sold out, I ended up buying this. Meaningless.” Just want until this Twitter user learns about the magical world of download codes.